Made this massive summer salad a couple years ago when I had some friends out to the beach house. Sigh, those were the days. Panzanella is generally an italian- tomato and stale bread based salad. But this Ina Garten is like an enchanced greek version. Would be great for picnics- summer bbqs etc. Place the cucumber, red pepper, yellow pepper, tomatoes and red onion in a large bowl [legit large- this makes a giant salad]. Ina way: For the vinaigrette, whisk together the garlic, oregano, mustard, vinegar, 1 teaspoon salt and the pepper in a small bowl. While still whisking, add the olive oil and make an emulsion. Tessa way: put all contents in a mason jar, shake vigorously. Pour the vinaigrette over the vegetables. 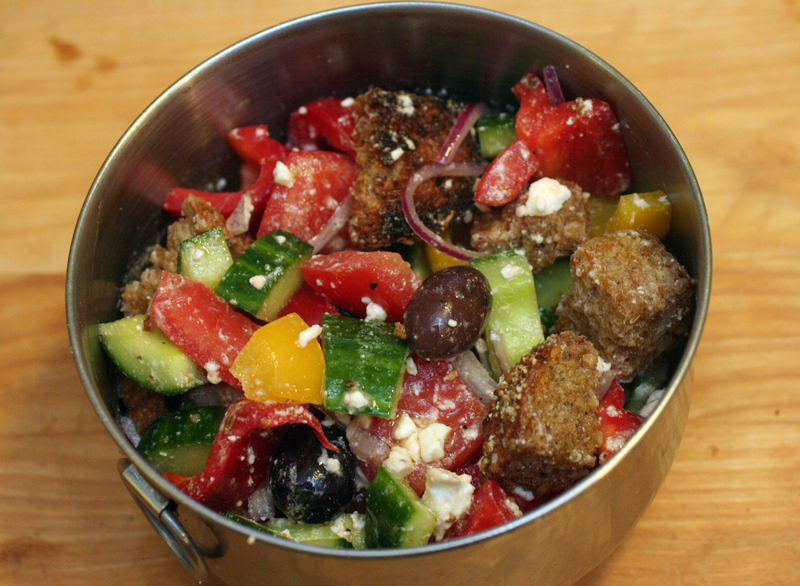 Add the feta, olives and bread cubes and mix together lightly. Set aside for 30 minutes for the flavors to blend. Serve at room temperature.